Award-winning writer Linda Cracknell gives her tips on sharing your walking experiences through the written word. After a day out in the hills, or even tramping for a couple of weeks on a long-distance footpath, some of us have the urge to commit the experience to writing. It might be scribbled in a journal as a personal record, a walk report or blog post with tips for those considering something similar, or even something crafted to communicate a story to a wider audience. One of the things I love about doing this is that I get to take the journey more than once. Conjuring afresh the sensations, the weather and terrain, I recover a sense of what the whole walk meant to me. The irony is perhaps that in writing essays, articles and a book about walking, (Doubling Back: Ten Paths Trodden in Memory) I’ve spent a great deal more time sitting at a computer writing and redrafting, than actually walking. But I offer here a few reflections on what I’ve learnt. A good piece of writing about moving through a landscape can make the reader feel they have shared the experience. This is achieved by giving them sensory details. To write effectively later, I find it essential to record observations of the walk at the time; otherwise memories get foggy. I usually carry a very small notebook in an accessible clothing pocket so that I have no excuse. And I attach a pencil to it (TOP TIP: pencils work even when it’s raining!). 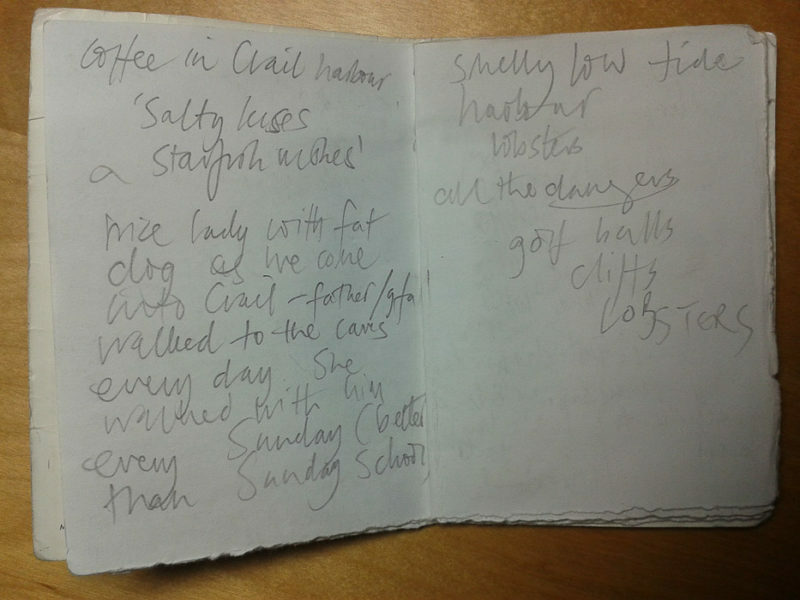 I don’t try to write in sentences but collect a handful of words, thoughts and observations which will jog my memory later, possibly along with details of names, coordinates etc. – observations of how I saw clusters of quartz unearthed by a mole. Later these words reminded me of what had struck me at the time. I take a lot of photographs for reference as well. A few of the best may end up complementing a piece of writing, but mostly I aim to build ‘word-pictures’. Most of us will find that our senses are dominated by visual information, which in turn dominates written description. But the most evocative observations may come from another sense. Think of the coconut scent of gorse on a summer’s day, for example, or the sensation of a northerly wind drilling into your forehead. It’s worth pausing on a walk and closing your eyes in order to fully appreciate the non-visual. For me, sounds are often the most evocative. On a recent walk around the Rosneath peninsula in dense low cloud, I orientated myself by an industrial roar from Gourock which increased in volume as I moved to the South point at Kilcreggan and then diminished behind me as I turned up the east coast and passed high above the clattering and clanging of a ship being fitted at Rosneath. These sounds seemed to sum up the sense of place. And on my pre-desk walk this morning, it wasn’t so much a new kind of brightness or warmth that made me feel the spring was coming, or even the banks of snowdrops and fragile dangle of new catkins, but the wraparound song of busy birds. Sometimes I take sound recordings on my phone as later they return me to the immediacy of my experience. There’s another advantage of taking notes or recordings along the way. Even if I never use them, it sharpens my senses and adds much pleasure to walking. I notice the first peep of returning oystercatchers to the Tay in mid-February, for example, or the plasticky texture of young beech leaves between my fingers. Once I start noticing, and being deliberate about it, I notice more and more. A walk taken in company has another quality that we might want to capture in words. 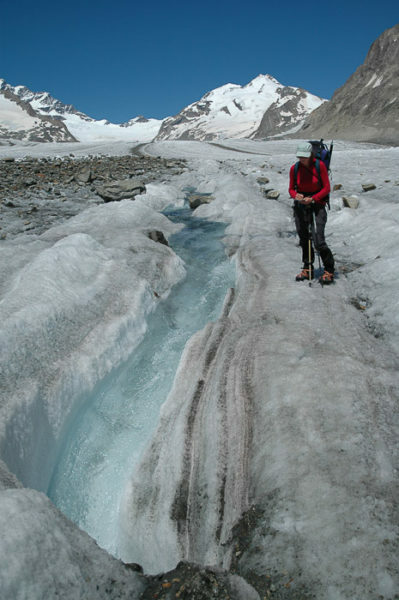 As Mark Twain said in A Tramp Abroad: ‘It is no matter whether one talks wisdom or nonsense, the case is the same, the bulk of the enjoyment [of the walk] lies in the wagging of the gladsome jaw and the flapping of the sympathetic ear.’ The social spirit of a group of walkers can be integral to the memory of a day out. I try to jot down the odd piece of dialogue, a joke, a difference of opinion, that might later illustrate the quality of companionship that comes about when you’re shoulder to shoulder rather than face to face. 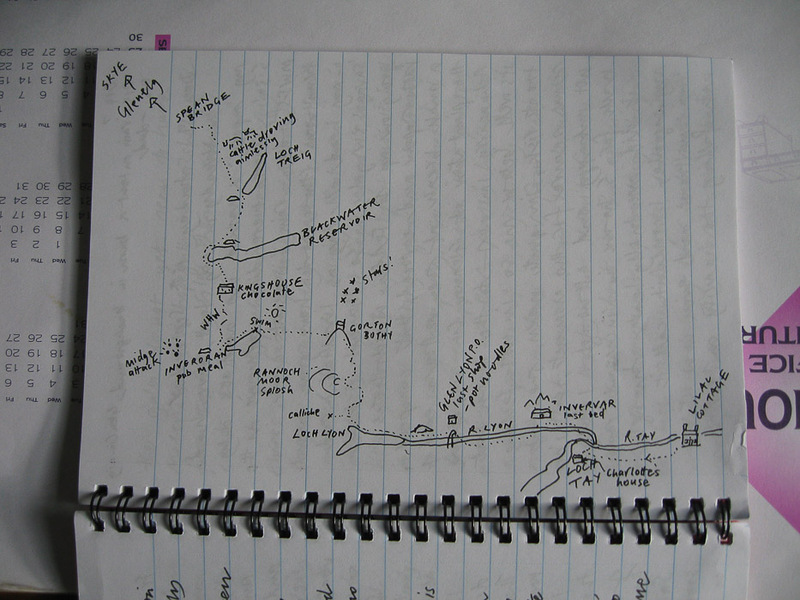 After returning from a walk, I might write my notes up in a journal entry and I often draw a small sketch map. This is different to an accurate route map and is intended to capture the memorable features of the walk, both physical and psychological: The burn in spate which caused a five-mile detour, the bog-of-never-letting-go, the low blood sugar point, the Brocken spectre. Sometimes I might take this no further, and one glance at the sketch map will bring the entire walk back in all its sumptuous and agonising detail and is far more personal than a folder full of photos. (And by the way you don’t need to be able to draw!). Sometimes a little research may be involved. It can be fun to know what some of those Gaelic names mean, or in which year a village was abandoned and why; but some information may be crucial to route-finding by others and there is a responsibility to get it right. Fortunately, we are each unique as observers and writers. Four people on the same walk would record it quite differently, and each also have their own way of conveying it, as can be seen from the variety and character of Walkhighlands trip reports. I once wrote an account from the point of view of a dog in the group. Perhaps understandably it concentrated on smells and on the resentment aroused by being left in the car at the end of the day while the other walkers celebrated in the pub. It’s useful to know who your audience is. A report for Walkhighlands is likely to be read by other walkers who will understand any associated technical vocabulary. But an ‘armchair’ traveller might need a different approach and even some convincing through wider context that your walk or climb was a good idea or an enjoyable thing to read about. The main rule about first drafts is to get it down. Later it can be shaped and crafted. The sketch map comes in handy as a guide to significant features or events, landmarks or turning points, ‘scenes’ or incidents which deserve the greatest concentration of words. It can also help you decide what can be omitted or simply summarised in a sentence (or one photo with a simple caption). There is a danger in including everything as inevitably the reader will tire and possibly not continue to the end. ‘twisted and intertwined like a cage of snakes’. ‘we dragged ourselves for the last hour on a silent route march’. Redrafting usually means being brave rather than precious about what you’ve written; prepared to cut mercilessly, known in the trade as ‘killing your darlings’. 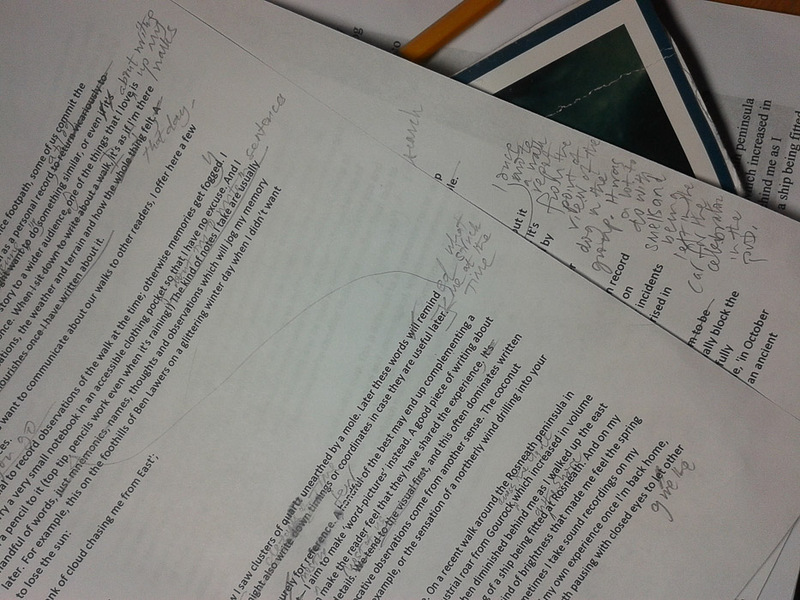 I find it useful to print out the piece and scribble revisions directly onto the page at this stage. If you want to do more than report, to tell a story, more thought has to be given to the shape of the piece. 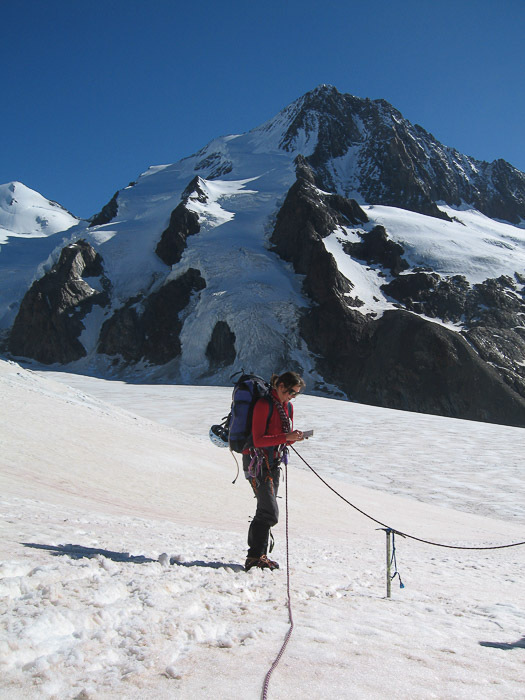 For example, in Doubling Back I wrote about an alpine climbing trip in which I aimed to follow in the footsteps of my father who died when I was very young. I began the essay at a point well into my four-day journey, when we were at the foot of the final climb and confronting a partially hidden crevasse. This was so I could start with something engagingly dramatic. Then, for context, I briefly filled in the episodes that had been chronologically before this. I interspersed what I knew of my father’s trip with my own 50 years later, but held back until near the end two significant pieces of information about what had happened to him in order to maintain a degree of tension and keep the reader wanting to know what would happen. These are narrative techniques well known to fiction writers, but they can serve well in non-fiction storytelling too. This kind of crafting can often best be achieved at the second draft stage. A story of this kind is usually about something more than the walk itself and it’s useful for the writer to articulate this to themselves. In arriving at a shape, an organising sentence can help – one that summarises exactly the story being told and its main themes. It provides a rationale for what to include in the narrative, and what could be omitted. One of the hard lessons I learnt when writing Doubling Back, was that stories which were ruthlessly faithful to every nitty-gritty detail of the original journey, were unengaging to readers. In general, ‘less is more’. In my own writing of whatever sort, I do a great deal of redrafting as my first drafts are sketchy and sometimes muddled. I aim to cut repetition, over-flowery language, irrelevant information and to refine expression at the sentence level. Once on the home straight, I read it aloud. This reveals all the errors, missed words and overlong sentences. It’s often the most brutal decisions about cuts at that stage which ensure that the piece of writing truly ‘sings’. And finally, painfully, there’s the title to choose!